•Digital means binary (1 0) and 1 and 0 may be true and false or on and off or high and low. •Analog means continuous signal or information represented by variable quantity. 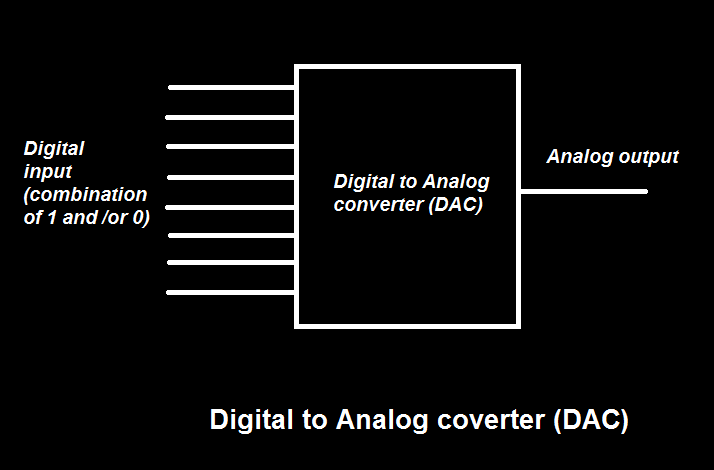 •DAC stands for Analog to Digital Converter. 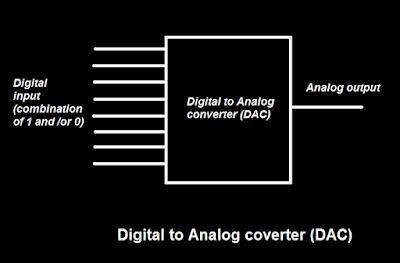 •DAC is a device use for converting digital data to analog form. •Application of DAC are in electronic audio devices, oscilloscope, printers, electronic speed controllers, Computer, telephone, mobile, etc. •DAC is like a modulator. •Converting signal from digital to analog degrade the signal therefore details are chosen to neglect errors. •Common types of DAC are pulse width modulator, oversampling DAC, binary weighted DAC, R-2R ladder DAC, Hybrid DAC etc. •Now DAC conversion is of three types one is Amplitude Shift Keying (ASK) second is Frequency Shift Keying (FSK) third is Phase Shift Keying (PSK). •Amplitude Shift Keying (ASK) is represent digital data as a variation in the amplitude of a carrier wave. •Frequency Shift Keying (FSK) is digital data is transmitted through discrete frequency changes of carrier wave. •Phase Shift Keying (PSK) is transmit digital data by changing the phase of carrier wave.